The Mile High City, so named because it sits at 5,280 feet above sea level or one mile high, Denver has been rocking since the late 1850s when gold was discovered around Cherry Creek. Today, it is one of America's hottest cities to live and play in and a great place to visit. With the Rocky Mountains as a backdrop and more than 300 days of sunshine per year, Denver is a visually appealing metropolis, filled with a variety of sights and attractions for everyone, from families to couples. Whether you are wandering the Denver Art Museum, doing some shopping and gallery hopping in Cherry Creek North, or visiting animals at the Denver Zoo, day or night, there is no shortage of things to do. The city also home to several parks, including Civic Center Park in the heart of downtown, Washington Park, Cheesman Park, and City Park in surrounding neighborhoods. Just outside the city limits is Denver's most famous park: Red Rocks Park & Amphitheater, which is one of the top outdoor concert venues in the U.S. Learn more about the best places to visit in the city with our list of the top attractions in Denver. Red Rocks Park & Amphitheater is about 15 miles from the city center but is well worth the commute as this is the most revered attraction around Denver - and there is a shuttle to get you here should you not have a car. 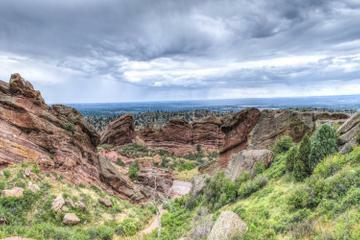 Red Rocks is both a live music venue and a city park owned by Denver. The name comes from the striking red sandstone rock formations found along the trails that also form the walls of the outdoor amphitheater. The venue attracts major live music talent weekly in season and is most famous for its acoustics. Music buffs will want to stop by the Colorado Music Hall of Fame, which tells the stories of Colorado's music greats. The Denver Museum of Nature and Science sits in City Park's southeast corner and is one of Denver's top cultural attractions. Among the most notable exhibits are the imposing dinosaur skeletons, remains of Ice Age animals, the collection of minerals presented by the Coors family, and one of the largest nuggets of gold found in Colorado. The museum features changing exhibitions, so there is always something new to see. An IMAX theater and a Planetarium are also on-site. When you've finished wandering this museum, take time to check out City Park, which is popular with locals, and hosts a free summer jazz concert series. The Denver Center for the Performing Arts sits on the south side of Larimar Square and is a gigantic cultural center, which hosts multiple venues including the Boettcher Concert Hall, Auditorium Theater, and Ellie Caulkins Opera House. If you are looking for things to do in Denver at night, you can usually find something to entertain you here. A night out at the Center for Performing Arts could mean watching a Broadway Show or enjoying a play or a variety of other performances. This venue hosts all kinds of major events. It is home to the Denver Center Theater Company, the Denver Center Attractions, and the Denver Center Theatre Academy. The center also functions as an educational facility, offering acting classes and programs, as well as professional development opportunities. The Denver Botanic Gardens, first laid out in the late 1950s, is one of the largest botanical gardens in the United States, occupying 23 acres next to Cheesman Park. The garden emphasizes native plants and sustainable, environmentally responsible practices. However, the various gardens display plants from all over the world. There are 43 individual gardens, some of which are laid out in natural landscapes, others of which are in more formal gardens. Some of the highlights include the Japanese Garden; Marnie's Pavilion with orchids, ferns, and waterfalls; and the Boettcher Memorial Conservatory, with exotic tropical and subtropical species. The Denver Botanic Gardens also hosts special events throughout the year, including concerts that draw in nationally recognized talent. Kirkland Museum displays a major collection of decorative art from 1880 to 1980. Every major design period is represented, from Arts & Crafts to Pop Art. Regional modernist art, from 1875 to 1980, with a focus on Colorado, is also documented with hundreds of works. The museum features a retrospective of Colorado's distinguished painter, Vance Kirkland (1904-1981). All three collections are housed in a 1911 Arts & Crafts building, the oldest commercial art building in Denver. Kirkland Museum is a member of Historic Artists' Homes and Studios, a program of the National Trust for Historic Preservation. The massive, fortress-like Denver Art Museum has a vast collection, which includes American Indian, African, European, Asian, and Oceanic Art. Collections also include Spanish colonial and pre-Columbian works. The remodeled Native American galleries are particularly impressive, covering a broad range of cultures and tribes from the United States and Canada. This extensive collection has gained a reputation throughout North America, with pieces that span 2,000 years of history. Also of note is the museum's African art collection. The modern and contemporary art collection features both well-known names and emerging talent in a variety of media. There is also a separate gallery dedicated to photography. The Denver Art Museum began in a building now known as the North Building, designed by Italian Architect Gio Ponti and opened in 1971. In 2006, the 146,000-square-foot Hamilton Building, an expansion designed by architect Daniel Libeskind, was opened to the public. The new building captured attention with its unique design, inspired by the peaks of the Rocky Mountains. Coors Field is the home of the Colorado Rockies baseball club. The stadium, which opened in 1995, has a seating capacity of 50,200. From some seats, it's possible to see the Rocky Mountains in the distance. There are tours of the facility year-round. This is a good way to learn about the stadium and see a bit of the behind-the-scenes action. Tickets are limited to a certain number each day, so advance purchases are a good idea. Tours last just under 1.5 hours and are accessible to those with disabilities. The Denver Zoo is beautifully laid out, with enclosures adapted to different species, from the polar bears' den to monkeys island. Management is committed to a long-term plan to replace and modernize exhibits. The zoo was begun in the late 1800s, so by the 1990s, the zoo was in need of an update, and work has been ongoing. Some of the newer exhibits at the Denver Zoo include Primate Panorama, Tropical Discovery, and Predator Ridge. Today, the zoo is one of Denver's most popular attractions. On a low hill on the east side of Civic Center Park is the classical-style State Capitol, crowned by a gilded dome 250 feet high. From the viewing platform on the drum of the dome there are magnificent views of the city's imposing skyline and the Front Range. The 13th step on the west side of the Capitol is exactly one mile above sea level, thus the name "mile high city." Famed architect Michael Graves designed the Denver Public Library, which opened in 1995. The library is noted for its western history and genealogical collections. Outside, the thirty-foot-tall, red-orange steel sculpture is often used for reference as a landmark. A successful example of urban refurbishment in Denver is Larimer Square, with well-restored buildings of the Civil War period. In 1971, Larimer Square became Denver's first historic district. Today, it is a major entertainment district. The area is home to art galleries, shops, cheerful restaurants, and gas lamps. It continues to evolve and is popular with both locals and tourists. During the day, most people come here to shop. In the evening, this is a great place for dining or seeing some live entertainment, such as comedians or bands. This area is also famous as the place where Buffalo Bill lived at one time. Running through the city center, the 16th Street Mall is a European-style pedestrian precinct, with shady trees, flowerbeds, and park benches. The only traffic here is a free shuttle bus. The street is lined with department stores, boutiques, souvenir shops, restaurants, and the stalls of street traders. Near the south end of the street are numerous modern and Post-Modern skyscrapers. Immediately beyond the City and County Building is the U.S. Mint, one of the United States' six facilities. This is where the American currency is created and part of the country's gold reserves are stored. Visitors can take a free guided tour of the facility to learn about the history and process of making money. There is a small gift shop on-site selling commemorative coins, souvenirs, games, and other items. Reservations for the tours are always required and can be scheduled online through the website. In the heart of Denver is the green and, in summer, agreeably shady Civic Center Park, laid out in Classical style with numerous monuments. Principal administrative buildings of the state of Colorado are scattered around the outskirts of the park. Along its north side is Colfax Ave, which is the longest street in America, running for 26 miles east to west through Denver. Located just south and east of the Downtown, Cherry Creek North is Denver's best known shopping district, especially if you're looking for luxury and boutique shops and art galleries. Covering some 16 blocks laid out in a square, the leafy and flower-strewn neighborhood is also home to numerous restaurants, offering cuisine from around the globe. Cherry Creek hosts a number of different events throughout the year, the most famous of which is the Cherry Creek Arts Festival, held around July 4th, which attracts national and international artist vendors in mediums ranging from painting and jewelry to ceramics. The district runs along 2nd and 3rd Ave between Steele Street to the east and University Boulevard to the west. Part of the first generation of Abstract Expressionist artists, Clyfford Still is considered one of the 20th century's most influential painters. The museum, which opened in late 2011, is home to an archive of more than 3,000 artworks by the late artist and showcases his life's work and legacy in exhibits in a minimalist-style building. Luxury Hotels: The landmark Brown Palace Hotel and Spa has been one of Denver's top luxury hotels since it first opened in 1892. This opulent hotel, in the heart of downtown, is also known for its superb customer service. Opened one year earlier, in 1891, is another of Denver's top hotels, The Oxford Hotel, near Union Station. By contrast, if you are looking for a contemporary luxury hotel, the uniquely designed the ART, near the Denver Art Museum, is the place to stay. Mid-Range Hotels: Near the Convention Center and just a short walk from the 16th Street Mall is the conveniently located Hilton Garden Inn. Nearby, and also in a great location is Aloft, with a modern look and trendy feel. The Hyatt House is a newly opened, extended-stay hotel in the city center, with standard rooms and suites featuring fully equipped kitchens, perfect for families. Budget Hotels: La Quinta Inn, north of Coors Field and the city center, is a good budget option. With more basic rooms but a slightly more convenient location is the Days Inn. Both of these hotels are on the periphery of the city center, either a long walk or short drive from the main downtown area. If you are willing to drive 30 minutes, the Comfort Inn is well outside the city center but offers quality rooms at budget prices. Take a Day Trip: Soaring mountains surround Denver, and a convenient way to experience this alpine wilderness is on the Rocky Mountains National Park Day Trip. Accompanied by the narration of an expert guide, this tour takes you in an air-conditioned coach across the Continental Divide, reaching altitudes of up to 12,000 feet. After strolling around the fun ski town of Winter Park, you can look for wildlife such as bighorn sheep and black bears in Rocky Mountain National Park. The tour includes admission to the park, lunch, and hotel pickup. If you're short on time but still want to venture into the wilderness, consider the Denver Mountain Parks with Optional Denver City Tour. This four-hour adventure includes a visit to Red Rocks park, a natural amphitheater; Bear Creek Canyon, where you can look for wildlife; and Lookout Mountain, with spectacular views. Hotel pickup and entrance fees are also included, and you can upgrade by adding an afternoon city tour. Summit a 14neer: From Idaho Springs, the highest mountain road in the U.S. runs steeply up past the beautifully situated Echo Lake to the alpine pastures on Mount Evans (14,266 feet). From the summit, there are breathtaking panoramic views out over the mountains and valley below. A variety of wildlife also frequents the area. At these elevations it is not uncommon to see mountain goats, bighorn sheep, marmots, and pika. The Mount Evans Highway (State Highway 5) is a seasonal road, which is closed during the winter months, usually reopening in late May. Opening dates may be weather dependent. Mount Evans gets particularly busy on summer weekends. Weekdays and early mornings are some of the less visited hours and may be a better option for people looking to escape large crowds. The Mountains: Denver is a gateway to the Rocky Mountains. Less than two hours away are some of the best ski resorts in Colorado, including Vail, Beaver Creek, Breckenridge, Keystone, and Arapahoe Basin. But you don't have to be a skier to enjoy the beautiful scenery. In summer, hiking, camping, biking, and sightseeing opportunities attract tourists from across North America. Fun mountain towns you may want to include on your Colorado itinerary include nearby Boulder and Colorado Springs, and in the far southwest of the state, Durango and Telluride, where you'll also find excellent skiing and snowboarding, as well as hiking and biking in summer. Mountain bikers should look to Fruita and Grand Junction for some awesome rides. For more ideas, see our article on the top attractions and places to visit in Colorado.